That’s what Hooters says about itself. I say they have delicious wings, curly fries, and good beer. Also, they know how to throw a pretty sweet half marathon. 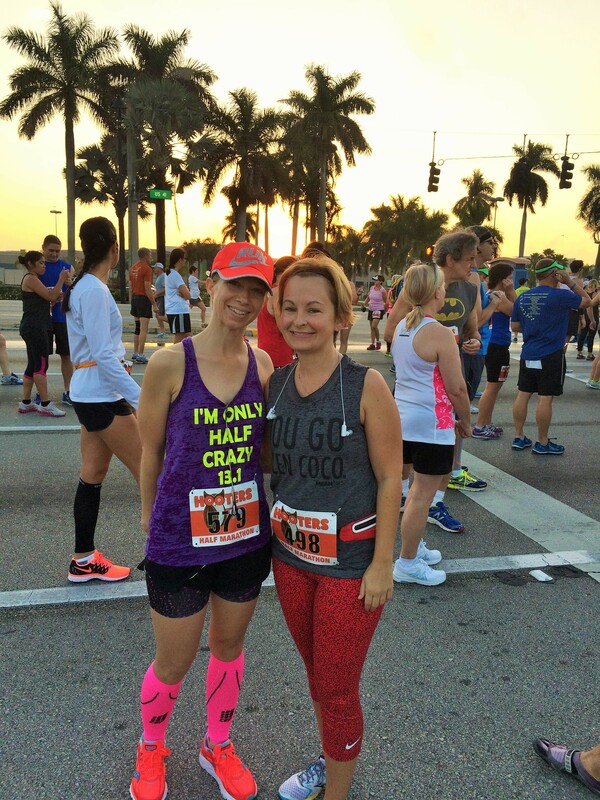 This past Sunday I laced up my sneaks and headed out for my second half marathon ever. Well, the first one was only in January so it wasn’t like I took a long break or anything. In fact, the Hooters Half almost didn’t even happen for me. I floundered back and forth about signing up until I finally just bit the bullet and went for it. After I signed up I was feeling pretty stoked. I ran the Disney Half Marathon in January (and met Mer and Brooke, YAAAAAY) and had an amazing time with my running buddy. We kept a good pace and finished at just over three hours, which I couldn’t tell you if that’s a good time or not, I just know I made it. I figured for my second half I should set some goals, right? Okay, after my running buddy texted me and asked if I had any goals I decided to set them. Basically my goal was to beat three hours. I figured that was a doable goal considering it was only my second time running this distance. The week leading up to the race wasn’t anything special. I wasn’t nervous like I was before Disney. I had this, right? I prepped the Saturday before by carb loading. By that I mean I ate a lot of Boom Chicka Pop and pretty much an entire box of macaroni and cheese for dinner. (Note: this is probably not a post you should take advice from, just saying.) I watched some videos on how to apply KT tape for some pain I’d been having, then I made my sister help me. She’s a personal trainer, so she’s good for stuff like that. 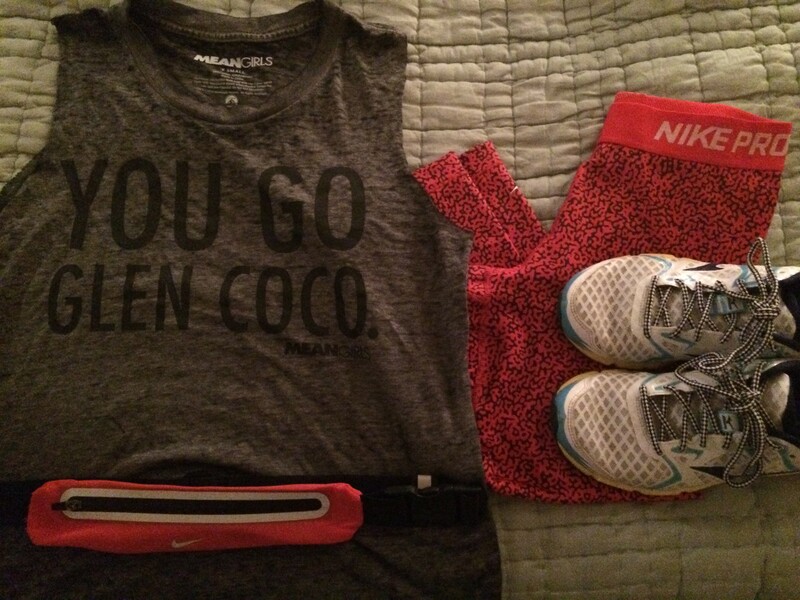 I also planned my outfit, because you can be cute and comfortable to run thirteen miles at the same time. Also, I’m single and you never know who you might “run” into. You can’t go wrong with Mean Girls. I went to bed at a decent hour, my alarm set at my normal-everyday-wake up time. For Disney my wake up time was 2:30AM. Thankfully, I only live about two miles from Hooters, so I didn’t have to get up that early. I was feeling pretty good the night before, but my nerves got the best of me Sunday morning. It probably had to do with the dream I had about my grandma beating me at the race. I blame the carbs. Breakfast was a small event: coffee (because I do nothing without coffee), oatmeal, and a banana. I don’t eat a lot in the morning, but I know it’s important to fuel up before a long run. My nerves were still going crazy by the time I met my friends in the crowded parking lot. This year’s race had about 1,100 people sign up and, as per the results, 800 finishers. We made a pit-stop at the Port-o-Johns because there’s nothing worse than having to run long distances while having to pee. Side note: I ran a ten-miler in October with no bathrooms on the course. Uncool. Anyway, after a bathroom stop we headed to the start line, just as that beautiful Florida sun started to rise. Oh, and ran into these beauties. My running buddy and I placed ourselves at the back of the pack, just to be safe. We both had goals and were prepared to help each other out with them, but we wanted to be comfortable with our starting pace and there’s really no pressure in the back. We got started just after 7AM with a pretty steady pace. Like I said, I wasn’t out to impress anyone but myself, but I was feeling pretty good at a twelve-minute mile. I know I don’t have a lot of speed, but what I lack I make up for in enthusiasm. By mile two I had to go to the bathroom, so we got water and I went. Water and bathrooms were both available every two miles, which was pretty awesome. The weather on this race (compared to 40s in Disney) was a little rough. 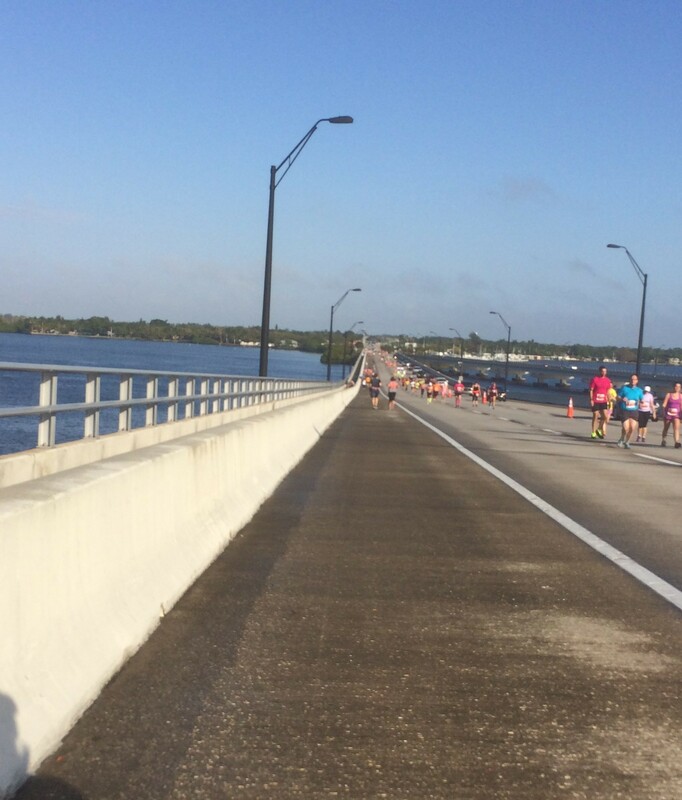 It was in the 70s and muggy, typical Southwest Florida, but more difficult when running thirteen miles. The course we were set on was nice, especially with the weather like it was. We had a great view of some nice neighborhoods on the river. The streets were flat, shady, and provided a nice breeze to counter the humidity. One of the things that I liked that most about running through the neighborhoods was the fact that people were hanging out in the streets cheering for us. Sometimes it was whole families, sometimes just a single old woman sipping her coffee (which I would have killed for), and once there was an innocent looking little girl with a sign that said: “Run fast. I just farted.” I’m still kicking myself for not taking a picture of that one. I started feeling some pain in my taped leg at about mile five, but I pushed through. Pain is temporary, you know. The first seven miles were like a cake walk compared to what came at mile eight. I’ve ran the Edison Bridge three times and the Hooters Half makes four. It never gets easier. In fact, this was pretty much my downfall. I had a GU at mile nine (Salted Caramel – yum) and some Gatorade because they were out of water at the station, and we kept on trucking. By mile ten my earphones died and I was left in silence. I’d like to blame the rest of the run on the fact that my headphones died and I had nothing to listen to so I couldn’t keep a pace or DO ANYTHING PRODUCTIVE. But, it’s probably more of the fact that I was starting to feel dehydrated and the pain I’d started feeling around mile five started to intensify. I told my running buddy to go on without me. I’m pretty sure my exact words were “Just leave me here to die!” so she did. She pushed me through those first ten miles and I was so, so grateful, but I knew she had a goal and I wanted her to reach it. I felt pretty good about still having her in my sight, like we were still going together, but eventually she turned a corner and I was on my own. After that I pulled my phone out and just listened to my music on speaker. My pace was still under fourteen minutes and I was looking good to finish under three hours. By the time I came around the back of the mall and toward the finish line I could have cried. People (volunteers and spectators alike) were still waiting and cheering, which is a great feeling. My friends met me just a few yards from the finish and ran the rest of the way with me, because they’re awesome and the best people I could ever imagine running with. 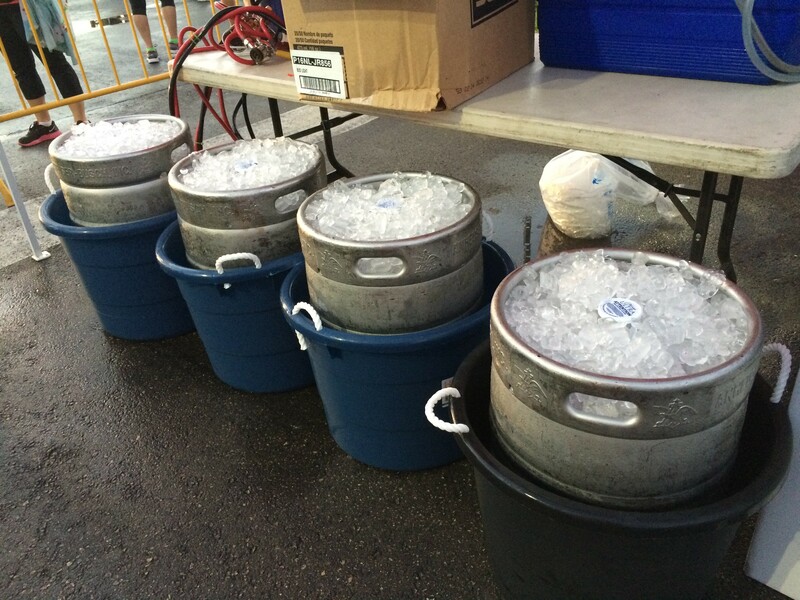 Of course, being the Hooters Half, there was free beer and wings at the finish line. As much as I wanted to take part in those delicious things I settled on water and grapes. I was feeling pretty dehydrated and in serious need of a nap, so I passed on the yummies, which was a little sad. 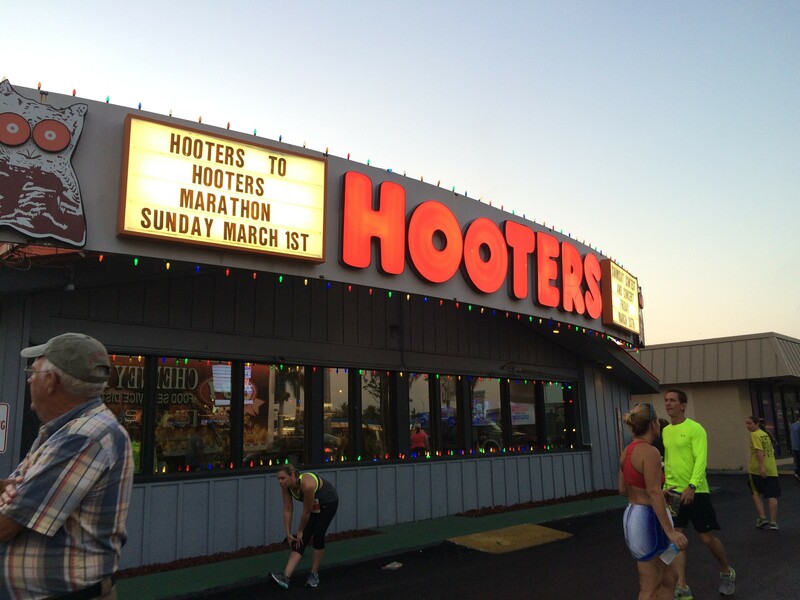 I mean, how do you run the Hooters Half and not eat the wings and drink the beer? It’s okay, there’s always next time. I really enjoyed this race, even the last three miles that completely sucked. It wasn’t a big crowd and the course was nice, plus it’s pretty close to my house so the travel time is minimal. And hey, a Hooters girl give you a medal. If you’re into that sort of thing. Also, according to my Nike+ app my finish time was 2:57:47. So, I managed a PR on my second half marathon, beating my old (first and only) time by ten minutes! Now I’ve got two half-marathons under my belt, but I’m ready to focus on some shorter distances. I prefer 10Ks and have a few lined up for the year already. But, of course, it’s all about the swag. You can find me on Instagram and Twitter with @thisgirlash_ if you like to talk about books, cats, and running (sometimes). I also blog at Ash Does Stuff. This entry was posted in Fun stuff, Guest Post, Race Recap and tagged ash, guest post, half marathon, hooters half, PR, running. Bookmark the permalink. Oh wow!!! 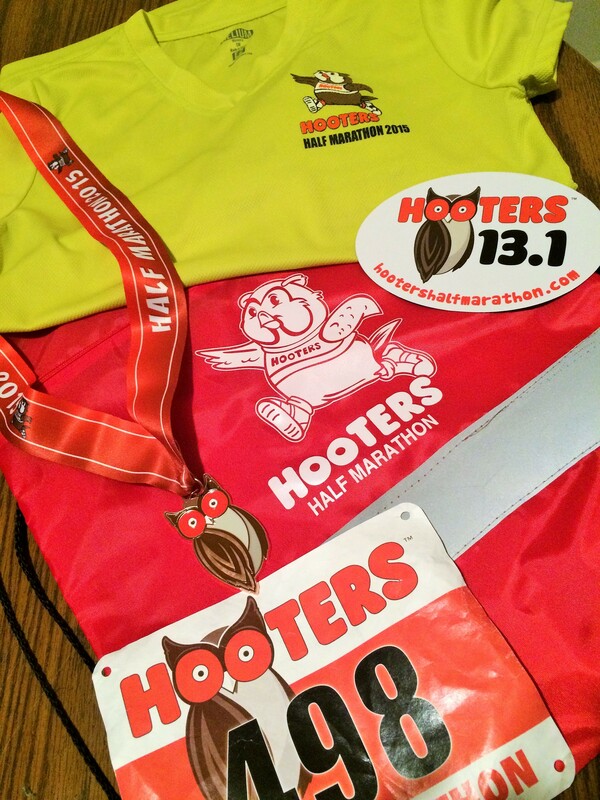 We need a Hooters Half Marathon here in Baton Rouge, Louisiana that would be AWESOME! You are fantastic!!! This is such an excellent post, I really felt like I was there with you the whole time running with you! And I LOVE the hooters medal! I’m running my first half in June (The ODDyssey in Philly). My longest run so far was a 10K in November and I barely survived that – why? Because half way through the course, literally at the half way mark, my phone died, i.e. no music! I was devastated and was running it by myself so I had no one to push me but me. I just had surgery the month before (thyroid cancer, had my thyroid removed) and I hadn’t been running that whole month. So I told myself I could run the first 3 and walk/run the last 3. But without having my phone to pace me, I knew if I started walking I wouldn’t do intervals. 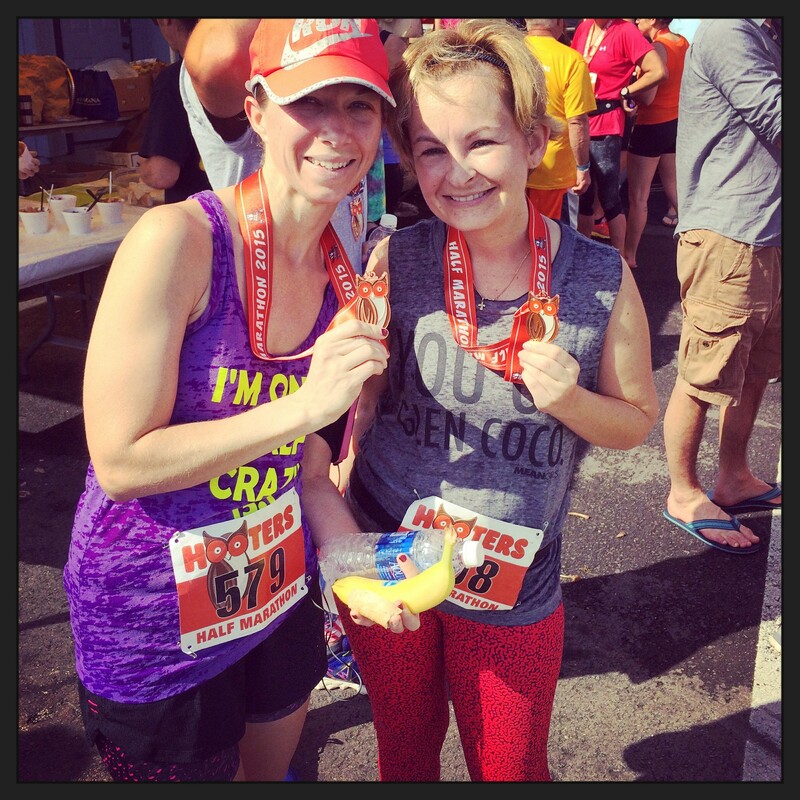 So I ran….slower than a turtle running through peanut butter, but I ran the rest. Super proud of myself but definitely a time I’m looking to beat. Music is SO important and I’m terrified of losing it in a run again, so I bring my phone and an iPod shuffle now. But I’ve improved since then, ran a 5 miler and a 5k this past weekend, both PRs for me! 🙂 I’m also doing the Broad Street Run in May. It was a lot of fun! Hope you get one! Whoops, wrong reply! Music is SO important. Kudos to people who can run without it, I just can’t. Good luck with your half! I’m getting ready to run my first 5K in May, and it’s people like you who encouraged me to try it, so thanks! I loved being a witness to your first half and while I wasn’t physically there, I nearly felt like I was there for your second! Thanks so much for sharing your experiences with us, Ash! I’ve actually never been to Hooters, we don’t have around these parts. But it sounds like they put on a quality race!